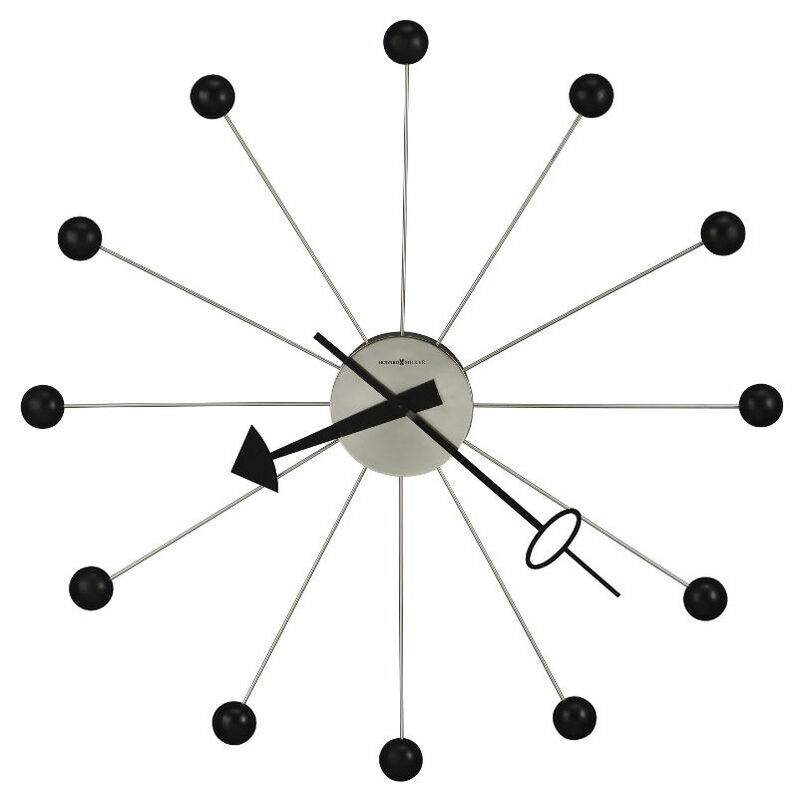 This contemporary-styled wall clock features a Merlot Cherry finish which compliments the brushed nickel-finished pendulum, bezel and side bars. The crisp white dial features black bar hour markers, black hour and minute hands, and a glass crystal. 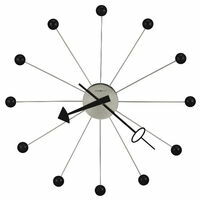 This retro clock is an adaptation of a classic George Nelson design that was first produced by Howard Miller in the 1940s. The center is finished in brushed nickel, and is surrounded by 12 black satin balls on nickel-finished rods. Black hands complete the duotone style. A flat glass covers the entire front of this contemporary wall clock, which features a Wenge look Black Coffee finished back panel with polished nickel-finished accents. Flat glass covers entire front. The white dial offers raised hour markers and straight hands, all with a nickel finish. The cylindrical pendulum, finished in polished nickel, complements the dial. Quartz battery-operated movement requires one AA sized batteries (not included). 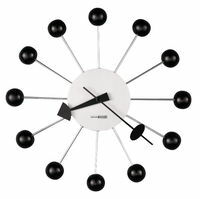 This contemporary wall clock features a half-round center finished in high gloss black lacquer with contrasting brushed nickel finished side panels. 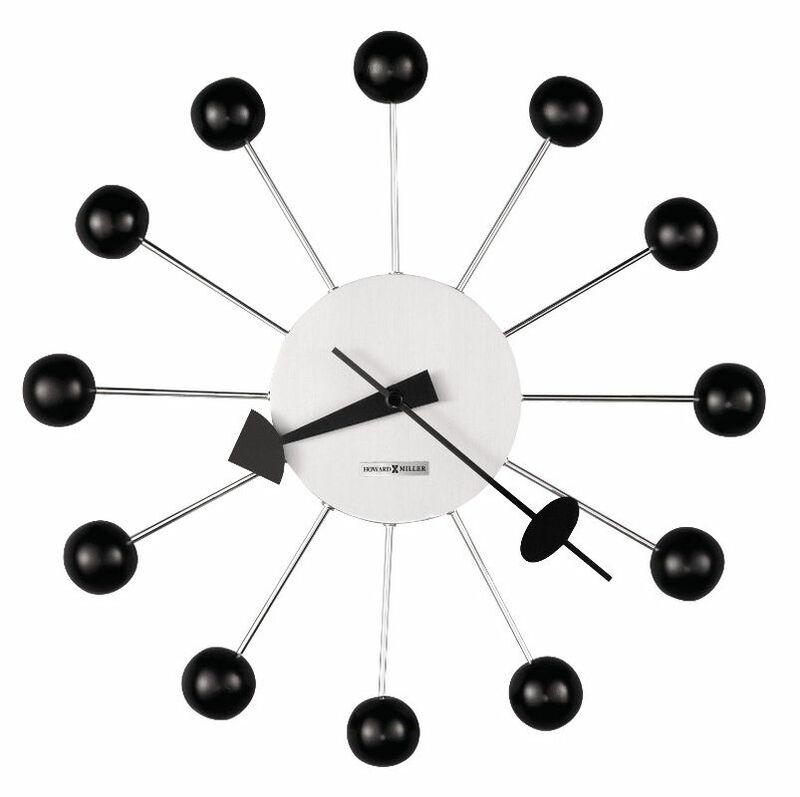 The black glass dial features polished chrome bar style hour markers and straight, brushed nickel-finished hands. 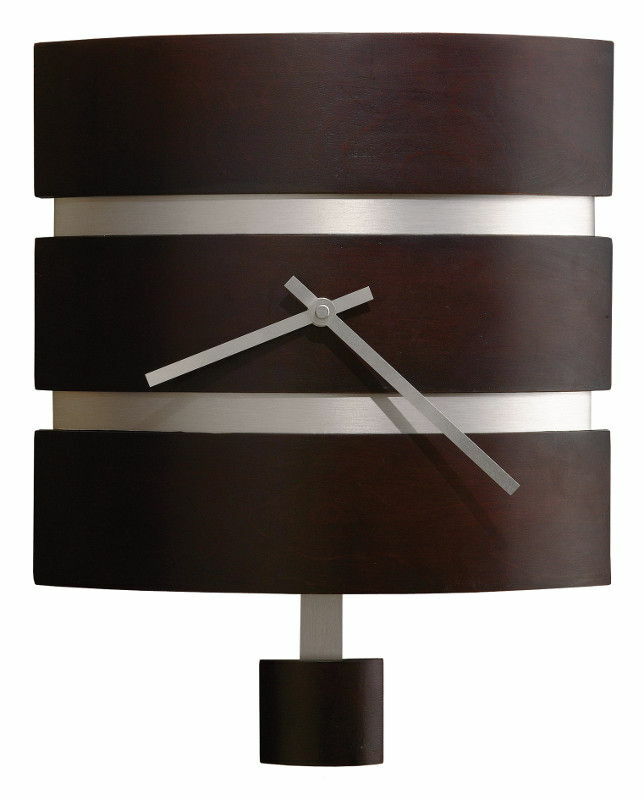 A rectangular pendulum, finished in brushed nickel, complements the dial. This contemporary rectangular wood wall clock features a curved front with recessed brushed nickel-finished bands, with complementing brushed nickel-finished hands. The curved pendulum bob, also finished in Black Coffee, is supported by a bold brushed nickel-finished stick to match the case.